I couldn't find any authentic pita bread or other flat bread at my local grocery store, so I decided to try grilling my own. It turned out to be really fun and not too difficult. And the taste was amazing. The hardest part was rolling out the dough (I doubled the recipe). Fortunately, I was able to do that while watching a playoff game, so it the time went by quickly. Grilling the flat bread was fun and easy. I was able to get six on the grill at a time, so it was very efficient relative to using a pan. center. Whisk together the yeast and water in small bowl to dissolve. Pour it into the well in the flour and let it sit for 10 minutes. Add the olive oil and thyme leaves to the well. Mix everything together and knead until you have a soft pliable dough, about 5 minutes (I kneaded by hand). Add more water if necessary. After the dough has roughly doubled in size, punch down and divide into twelve equal pieces. Roll each piece out as thinly as possible and place the rounds on parchment-lined sheet pans. Let the Flat Breads rise covered with a damp towel for 20 minutes. While flat breads are rising, preheat your grill to medium. Spray olive oil on the grill then place as many flat breads on the grill as will fit. Let grill 2-3 minutes a side. gently popping air bubbles as they arise. Check for grill marks and flip when the down facing side is lightly golden. 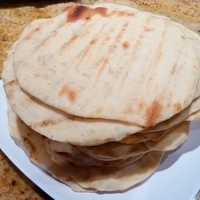 Remove the Flat Bread from the grill and wrap in a towel or foil to keep warm. (I kept them on the warming tray above my grill on a piece of foil. Repeat with the remaining dough. Adjust the heat as necessary to prevent the bread from burning. These are definitely better than store bought. If you've got the time and the inclination, give it a shot!